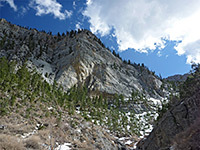 Big Falls and Mary Jane Falls are two seasonal waterfalls at the upper end of Kyle Canyon, which is one of the largest ravines on the east side of Mount Charleston in the Spring Mountains, and provides a course for Hwy 157, the southernmost of the two main routes into the high country. Like most drainages on the mountain, the falls are fed by melting snow, so their size and duration are dependent on winter precipitation. 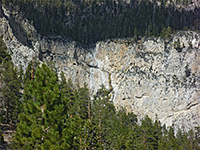 Despite its name, Big Falls sometimes dries up sooner, by mid spring, while Mary Jane Falls normally continues into early summer. 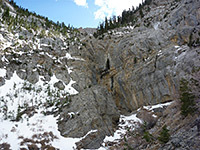 The scenery around the two cascades is somewhat different; Big Falls is probably more spectacular, though the wider views are better at Mary Jane Falls as it is higher, overlooking several miles of Kyle Canyon. 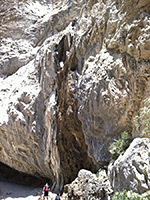 The former waterfall lies at the head of a short side ravine, enclosed by cliffs of grey brown limestone, and the drainage is briefly narrow for a short distance; the latter flows over a less confined part of the cliffs though is made more interesting by two small caves just to one side. Both falls share an approach route - a wide track, once a road leading to a campground (this was destroyed by floods and not rebuilt), which gives way to a steep but well used and not too difficult trail up to Mary Jane Falls. Big Falls is reached initially by a lesser, unofficial trail, forking off about half way, though much of the route simply involves walking up the boulder-filled ravine, and so this location is much less visited. 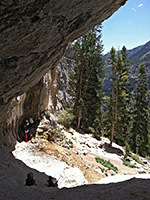 Both can be seen on a round trip of 4.6 miles, taking three hours or more. Big Falls/Mary Jane Falls topographic map. 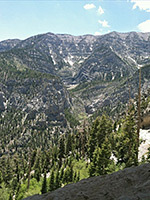 Beyond the village of Mount Charleston, a paved and later gravel road continues another mile to a sizeable parking lot for the trail to Mary Jane Falls, at elevation 7,706 feet, just past the equally large trailhead for the Trail Canyon Trail, the principal hiking route into the mountains. Facilities are limited to restrooms and an information board. 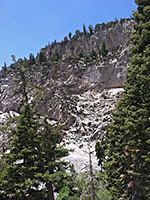 Steep slopes rise on both sides, especially to the southwest, where a line of sheer cliffs are visible above the pine trees. The trail starts from the far end of the parking lot, on the north side of the usually dry drainage channel, and is fairly level at first, running through mixed conifer and aspen woodland. After 0.7 miles it moves a little further away from the streambed, leaves the old campground road to the right - at a junction marked by a small sign, then starts a short, steep series of switchbacks, gaining 500 feet, up to the foot of the cliffs a little way south of the falls. The last section is much less steep, heading north, along with the base of the cliffs to the cascade, which is located at the head of a shallow ravine. The surroundings are now quite open, and in front stretches a sizeable area of bare earth, party covered, in spring, by piles of snow. Near the falls are the two caves, and a third can be found after a few minute's walking to the north, at the same level. The route to Big Falls splits from the Mary Jane Falls Trail at the signed junction with the old campground road, continues on the road for a short distance then bears left along a narrow path, descending through the trees to the wide streambed on the valley floor. A path resumes on the far side, rising to cross a forested area then dropping back down to the streambed, which now is angled north-south - densely wooded on the more sheltered eastern side, more open to the west. Faint paths follow parts of the drainage though walking is often easiest right along the creek bed. This narrows after a while, and at one point is blocked by a large boulder. 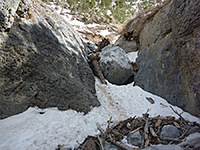 An improvised ladder formed of an old tree trunk is usually placed to assist climbing up; if not, the obstacle can be bypassed on the north side. Beyond, the drainage is temporarily less confined, and the final part of the route is across stony, treeless slopes to the north, aiming for the head of the valley, where the sides steepen and form a short cliff-bound ravine, with the waterfall at the far end. When flowing, the falls sustain a big pool at the base, but at most times of year the ravine contains only boulders, logs and snow. Views are good all the time however, of the stark, grey, streaked cliffs, the higher mountains above, and the grand valley downstream.